LPG converted - Perfect for caravan users with a supply of LPG. Dual fuel model - Can be powered by both LPG and petrol. Pure sine wave output – Producing 2000w / 2kW of power. Lightweight & Portable – 20kg with a built-in carry handle. “Eco” mode – Saves you money with increased fuel efficiency. Long running time – Maximum runtime of 11 hours. 80cc recoil start engine – Providing reliable performance. Quiet running – Easy to talk over at only 58dBA @ 7m. Full LED screen - Displaying the vital statistics. 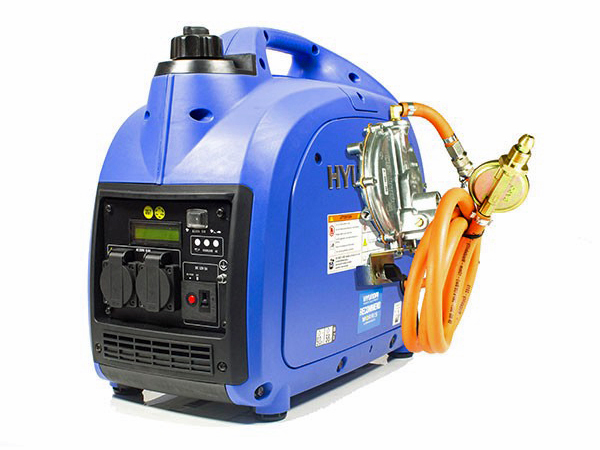 The popular HY2000Si from Hyundai is a portable and compact inverter generator. Producing twice the power of the HY1000Si, it’s a convenient and economical generator for caravan, camping and motorhome trips. This is the dual fuel version of the HY2000Si which has been converted to run off LPG as well as petrol. If you own a caravan and already use and store LPG on your travels, having your inverter generator converted to run off LPG results in many benefits. Equipped with a new digital LED display and hour clock, this inverter generator is commonly known as a suitcase-style generator. It is best used to power family holidays but can also be used in emergency situations when there may be a power outage. With an inverter generator, even if you’re away from a mains supply, you can still enjoy the modern luxuries of home, powering televisions, laptops, hair dryers and straighteners, lights, electric heaters and even air compressors for inflating beds and tyres. Powered by an easy starting and reliable 80cc Hyundai HX125 four-stroke petrol engine, this suitcase generator is capable of producing up to 2kW. Like all Hyundai inverter generators, the HY2000Si produces a pure sinewave output which mimics the power produced by the mains supply and poses no risk to any sensitive electronic appliances. The control panel features 2x 230v sockets for use with any equipment that features a standard 13A UK mains plug, eliminating the need to bring any special adapters. With a user friendly design you don’t need to be an expert to use this inverter generator, boasting such safety features as digital overload protection and low oil shutdown. This means that if you try to apply too much load to the generator, or if the oil levels fall too low, the generator will simply shut down to prevent any damage from occurring. Regular maintenance of this suitcase generator is simple, and Hyundai’s fantastic support is always there to help you if you have any questions. The HY2000Si-LPG weighs 23kg which is not much over the weight of the entry level HY1000Si, The LPG conversion adds 1.7kg to the overall weight over this suitcase generator and for the added power this is an extremely lightweight design. There’s a built-in carry handle to make transportation as easy as possible, and the compact dimensions allows for convenient storage in locations such as a caravan, camper van, motorhome or even car boot. With a large 3.8L fuel tank capacity, you can typically get around 5.5hrs of use out of this generator at 50% load before it will require refuelling. This allows you to focus on enjoying time with your family or friends, rather than constantly managing the generator. The “ECO” mode can extend the running time, as it lowers the engine revs to meet only the power draw that’s required which increases the fuel economy and lowers the noise produced. Best of all, “ECO” mode also helps extend the lifespan of the engine, guaranteeing you’ll get years of service out of your inverter generator.